With new federal grants and student loans available to low- and middle-income Americans in the early 1970s, for-profit colleges expanded rapidly to take advantage, frequently failing to deliver on their promises. Student loan defaults rose as a result. Shady schools also targeted American soldiers in Vietnam, as the GI Bill extended benefits not only to veterans but also to active duty servicemen. “Correspondence schools,” a more primitive version of today’s online education, expanded rapidly, frequently using misleading sales techniques. Dropout rates were high. To protect consumers and taxpayers, the Nixon and Ford administrations sought to prevent schools from relying solely on students financed by federal aid. The Federal Trade Commission developed regulations to prevent vocational schools from deceiving students about job placement rates. This report is the second in a TCF series—The Cycle of Scandal at For-Profit Colleges—examining the troubled history of for-profit higher education, from the problems that plagued the post-World War II GI Bill to the reform efforts undertaken by the George H. W. Bush administration. The return home of thousands of war veterans can bring out the worst in for-profit higher education. The epidemic of fraud and abuse by trade schools that enrolled World War II veterans under the GI Bill, which prompted intense scrutiny by Congress and Presidents Harry S. Truman and Dwight Eisenhower, is a prime example. Unfortunately, Johnson’s optimism proved premature. The extension of GI Bill benefits not just to veterans but to active duty servicemen fed a rapid expansion of “correspondence schools,” a more primitive and less interactive version of today’s online education, conducted through the U.S. Mail (see Figure 1). The growth in this for-profit education industry was spurred in large part by the fact that soldiers and veterans could enroll while also holding a full-time job. A report ordered by Congress warned in September 1973 that “private profit making home study schools” were using misleading advertisements and “sophisticated sales techniques” to take advantage of Vietnam veterans and servicemen, who subsequently dropped out at high rates.3 The Trump University scam used similar sales techniques. Figure 1. Number of Veterans in Training by Correspondence. Source: GI Bills Report. Just three years later, Congress merged the vocational school loan program into the Higher Education Act. Because this step effectively eliminated any cap on the growth of for-profit colleges financed by federal loans, it was the floodgate-opening that Bell, the top education official to Presidents Nixon, Ford, and Reagan, blamed for the default crisis. As Bell accurately characterized, it proved to be an invitation for excess. Left: The Wall Street Journal (June 10, 1970). Right: The Washington Post (1971). Meanwhile, the Chicago Tribune investigated Chicago-area career schools and correspondence schools. The Chicago Tribune’s series concluded that the industry was “filled with fast-buck operators preying on men and women who believe education is the best way to secure a future. Countless persons seeking to become airline stewardesses, nurses’ aides, TV repairmen, truck drivers, cashiers, and interior decorators are spending $3 billion a year for correspondence and residence school courses. Many are worthless or of questionable value.”27 State records, the Chicago Tribune reported, showed that of the 1,037 students who enrolled in a training program for travel agents in 1974, 686 students dropped out, and only 9 individuals were placed in jobs—a success rate just under 1 percent. Caspar Weinberger, the secretary of health, education, and welfare (who would later become defense secretary in the Reagan administration), saw many students as victims who should not have to repay their loans if the school misled them. Congress, meanwhile, in a law that expanded GI Bill benefits for Vietnam veterans, banned schools from education and training programs that used recruiting or advertising which was “erroneous, deceptive, or misleading either by actual statement, omission, or intimation.”53 (The bill’s cost drew a veto from President Gerald Ford that was subsequently overridden by Congress). As a result, default rates dropped, and, in a 1982 retrospective on his time at HEW, Caspar Weinberger declared victory: “History apparently had judged our efforts to limit GSLP [guaranteed student loan program] abuses to be successful.”59 The reforms, however, did not stick. Loopholes in the HEW regulations, as well as lawsuits and lobbying by the industry, soon undermined the new federal laws and regulations. Abuses of both the student loan program and the Pell Grant program resurfaced with a vengeance just a few years later during the administration of a Republican icon, President Ronald Reagan. CORRECTION: An earlier version of this report stated that ACICS lost federal recognition in 2015, when this actually occurred in 2016. The report was updated to reflect this correction on March 14, 2017. Educational Benefits Available for Returning Vietnam Era Veterans, Part I, Hearings before the Subcommittee on Readjustment, Education, and Employment, Senate Committee on Veterans’ Affairs, 92nd Cong., 2nd Sess., March 23, 1972, https://drive.google.com/file/d/0B7aqIo3eYEUtbHo3N0tya29uRjA/view?usp=sharing. James Bowman et al., “Educational Assistance to Veterans: A Comparative Study of Three GI Bills,” Educational Testing Service, September 1973, reprinted in Final Report on Educational Assistance to Veterans: A Comparative Study of Three G.I. Bills, Committee on Veterans’ Affairs, U.S. Senate, Senate Committee Print No. 18, September 20, 1973, 93rd Cong., 1st sess., 171, 181, https://drive.google.com/file/d/0B7aqIo3eYEUtamhSMmRzcURGdTg/view?usp=sharing. Testimony of Harold Orlans in Proprietary Vocational Schools, Special Studies Subcommittee of the House Committee on Government Operations, 93rd Cong, 2nd Sess., July 1974, 56, https://drive.google.com/file/d/0B7aqIo3eYEUteWUtOUtva0NVUVk/view?usp=sharing. Terrel Bell (who later became President Reagan’s education secretary), in “Guaranteed Student Loan Program,” Hearings before the Permanent Subcommittee on Investigations of the Committee on Government Operations, United States Senate, Part I, 1976, 282, https://drive.google.com/file/d/0B7aqIo3eYEUtZTVLVmJHeE42MFE/view?usp=sharing. Loans to borrowers from for-profit schools accounted for 88 percent of all delinquent funds paid. Proprietary Vocational and Home Study Schools, Final Report to the Federal Trade Commission and Proposed Trade Regulation Rule, Part II, Federal Trade Commission, December 10, 1976, 510, https://drive.google.com/file/d/0B7aqIo3eYEUtQUhtUXRmOTFzZFk/view?usp=sharing. Charlotte J. Fraas, “Proprietary Schools and Student Financial Aid Programs: Background and Policy Issues,” Congressional Research Service, 90-427 EPW, Aug. 31, 1990, p. CRS-51. When Congressman William Ford (D-Michigan), the future chairman of the House Education and Labor Committee arrived in Washington after being elected in 1964, he found that Congress was still “broiling with anger” about the misuse of federal student aid dollars. The anger, Ford recalled, “remained from the period of the much-publicized abuses of the GI bill.” Hearings on the Reauthorization of The Higher Education Act of 1965: Program Integrity, House Committee on Education and Labor, Subcommittee on Postsecondary Education, 102nd Cong., 1st Sess., Serial No. 102-39, May 30, 1991, 427, https://drive.google.com/file/d/0B7aqIo3eYEUtTmxZMF9fa2JPb3c/view?usp=sharing. The vocational program began much smaller. The National Vocational Student Loan Insurance Act of 1965 authorized insurance for an estimated $19 million in loans, according to President Johnson’s signing statement available at http://www.presidency.ucsb.edu/ws/?pid=27327. The Higher Education Act, P.L. 89-329, called for loan guarantees up to $1.4 billion. Larry Van Dyne, “The ‘FISL Factories,’” The Chronicle of Higher Education 10, no. 19, August 4, 1975, 5. https://drive.google.com/file/d/0B7aqIo3eYEUtSzVERHVsS3BhMm8/view?usp=sharing. Quoted in Proprietary Vocational and Home Study Schools, Final Report to the Federal Trade Commission and Proposed Trade Regulation Rule, Federal Trade Commission, December 10, 1976, 157, https://drive.google.com/file/d/0B7aqIo3eYEUtQUhtUXRmOTFzZFk/view?usp=sharing. Quoted in Larry Van Dyne, “The ‘FISL Factories,’” The Chronicle of Higher Education, August 4, 1975, 4. https://drive.google.com/file/d/0B7aqIo3eYEUtSzVERHVsS3BhMm8/view?usp=sharing. Proprietary Vocational and Home Study Schools, Final Report to the Federal Trade Commission and Proposed Trade Regulation Rule, Federal Trade Commission, December 10, 1976, 298, https://drive.google.com/file/d/0B7aqIo3eYEUtQUhtUXRmOTFzZFk/view?usp=sharing. Dan Rottenberg, “Many Computer Schools Charged with Offering a Useless Education,” Wall Street Journal, June 10, 1970, 1. https://drive.google.com/file/d/0B7aqIo3eYEUtc1ctUDBkb1dXa3M/view?usp=sharing. Carl Bernstein, “Hard Sell on Job Training,” Washington Post, July 12, 1971, A1, A3, https://drive.google.com/file/d/0B7aqIo3eYEUtSTNqY3M2Y0JxNFU/view?usp=sharing. Carl Bernstein, “Career Schools Find Haven in Washington,” Washington Post, July 15, 1971, B1, B2, https://drive.google.com/file/d/0B7aqIo3eYEUtSjN6Z2NVOGVZWGM/view?usp=sharing. “Career Schools: Broken Rules, Shattered Hopes,” Washington Post, October 7, 1971, A22, https://drive.google.com/file/d/0B7aqIo3eYEUtWGY1ZGVLN094dWc/view?usp=sharing. “How to Discourage College Students,” Washington Post, Aug. 22, 2010, A14, http://www.washingtonpost.com/wp-dyn/content/article/2010/08/21/AR2010082102468.html. The Washington Post’s editorial prominently disclosed that “Readers should know that we have a conflict of interest regarding this subject. The Washington Post Co., which owns the Post newspaper and washingtonpost.com, also owns Kaplan University and other for-profit schools of higher education that, according to company officials, could be harmed by the proposed regulations.” The Post’s ombudsman suggested in November 2010 that the paper expand its coverage of allegations against Kaplan. Andrew Alexander, “Post Needs to Beef Up Its Coverage of Allegations against Kaplan,” Washington Post, November 19, 2010. Nine days earlier, the New York Times had run an extensive front-page story on the allegations against Kaplan. See Tamar Lewin, “Scrutiny and Suits Take a Toll On For-Profit College Company,“ New York Times, November 10, 2010, http://www.nytimes.com/2010/11/10/education/10kaplan.html. Chester Finn Jr., “In Washington We Trust, Federalism and the Universities: The Balance Shifts,“ Change 7, no. 10 (Winter 1975/76): 26, https://drive.google.com/file/d/0B7aqIo3eYEUtYlM1bW1PTXVVYWc/view?usp=sharing. Spotlight Team, “Many Career Schools Turn Education Into a Fast-Buck,“ Boston Globe, March 26, 1974, https://drive.google.com/file/d/0B7aqIo3eYEUtcTh1QXVmaVd4eTg/view?usp=sharing. Spotlight Team, “ITT Tech watches profit, puts quality training in back row,” Boston Globe, March 26, 1974. The complete Spotlight Team series from the Boston Globe, which ran from March 25 to April 1, 1974, was reprinted in the Congressional Record, Senate, April 4, 1974, S5235-S5249, https://drive.google.com/file/d/0B7aqIo3eYEUtcW5yd1hDeVZaa2s/view?usp=sharing. Spotlight Team, “ITT Health-Assistant Courses Prove Costly, Bitter Lessons,” Boston Globe, March 26, 1974, https://drive.google.com/file/d/0B7aqIo3eYEUtX3kxMVNSUkRHenM/view?usp=sharing. Spotlight Team, “ITT Tech watches profit, puts quality training in back row,” Boston Globe, March 26, 1974, https://drive.google.com/file/d/0B7aqIo3eYEUtcW5yd1hDeVZaa2s/view?usp=sharing. Tribune Task Force Report, “Career schools—results seldom equal promise,” Chicago Tribune, June 8, 1975, 1, https://drive.google.com/file/d/0B7aqIo3eYEUtUGlzYURKdDNla3c/view?usp=sharing. Eric Wentworth, “Profit-Making Schools: Deception and Exploitation Charged,” First in the series, “The Knowledge Hustlers,” Washington Post, June 23, 1974, A1, https://drive.google.com/file/d/0B7aqIo3eYEUtdElVU3d0MFBEbjA/view?usp=sharing. Eric Wentworth, “Folding Schools Increase Loan Defaults,” Second in a series, “The Knowledge Hustlers,” Washington Post, June 24, 1974, A1, https://drive.google.com/file/d/0B7aqIo3eYEUtOWdFMUZ3eEl2ZXc/view?usp=sharing. Eric Wentworth, “For Thousands, Accreditation Has Spelled Deception,” Last in a series, “The Knowledge Hustlers,” Washington Post, June 26, 1974, A14, https://drive.google.com/file/d/0B7aqIo3eYEUtOW85a3VLSmx0dkU/view?usp=sharing. Wentworth, “Folding Schools Increase Loan Defaults,”A1, A14, https://drive.google.com/file/d/0B7aqIo3eYEUtOWdFMUZ3eEl2ZXc/view?usp=sharing. Paul Fain, “Education Secretary Drops Recognition of Accreditor,” Inside Higher Ed, December 13, 2016, https://www.insidehighered.com/quicktakes/2016/12/13/education-secretary-drops-recognition-accreditor. CBS Evening News with Walter Cronkite, August 18–19, 1975. Roger Mudd substituted as anchor for Cronkite for both broadcasts. The two Special Reports on for-profit schools were reported by Sharron Lovejoy, with an assist from Bernard Kalb. Quoted in Wellford W. Wilms, “Proprietary Schools and Student Financial Aid,” The Journal of Student Financial Aid 13, no. 2 (Spring 1983): 9, https://drive.google.com/file/d/0B7aqIo3eYEUtVDV3WFpkZTVKcnM/view?usp=sharing. The chairman of the FTC was Lewis Engman, a Nixon loyalist who had been the assistant director of Nixon’s White House Domestic Policy Council and subsequently became head of the Pharmaceutical Manufacturers Association. Nixon White House aide Elizabeth Hanford, who would soon marry GOP Senator Bob Dole and go on herself to become a GOP senator, was one of the five FTC commissioners. See testimony of Joan Z. Bernstein, deputy director of the Bureau of Consumer Protection at the FTC, in Proprietary Vocational Schools, Hearings of the Special Studies Subcommittee of the House Committee on Government Operations, July 1974, 17, https://drive.google.com/file/d/0B7aqIo3eYEUteWUtOUtva0NVUVk/view?usp=sharing. The celebrities included Della Reese, an African-American singer-actress-talk show host, and Raymond Burr, known for portraying District Attorney Perry Mason in an eponymous long-running television series. Ibid., 42–44. Proprietary Vocational and Home Study Schools, Final Report to the Federal Trade Commission and Proposed Trade Regulation Rule, Federal Trade Commission, December 10, 1976, 21, https://drive.google.com/file/d/0B7aqIo3eYEUtQUhtUXRmOTFzZFk/view?usp=sharing. Proprietary Vocational Schools, Hearings of the Special Studies Subcommittee of the House Committee on Government Operations, July 1974, 42, https://drive.google.com/file/d/0B7aqIo3eYEUteWUtOUtva0NVUVk/view?usp=sharing. Many industry advocates bitterly resented the FTC campaign and vowed to lobby Congress to undo the FTC’s actions. At the July 1974 House hearing, Joseph Clark, president of the National Association of State Administrators and Supervisors of Private Schools, attacked the “generals“ at the FTC for shooting expanding “dum-dum bullets” at for-profit schools by employing “well-known personalities whose words explode in the minds of the consumer, killing unfortunately, that’s person attempt to obtain a good education.” Ibid., 82. Clark also warned the chairman of the House subcommittee, Representative Floyd Hicks (D-WA), that “I’m speaking right now for 42 states in the nation when I’m telling you they are so upset . . . what’s going to happen is that at some point we are going to start fighting them in Congress and the Senate. And when you stop and multiply 42 States by the number of Congressmen and Senators we have, I don’t think the Federal Trade Commission wants that kind of a fight.” Ibid, 112, https://drive.google.com/file/d/0B7aqIo3eYEUteWUtOUtva0NVUVk/view?usp=sharing. Proprietary Vocational Schools, Special Studies Subcommittee of the House Committee on Government Operations, July 1974, 3, https://drive.google.com/file/d/0B7aqIo3eYEUteWUtOUtva0NVUVk/view?usp=sharing. Pritchard had asked, “Have you sent up any legislation or did you bring forth any legislation that would have given you either more clout or some type of an answer to this problem?“ Proprietary Vocational Schools, Special Studies Subcommittee of the House Committee on Government Operations, July 1974, 44, https://drive.google.com/file/d/0B7aqIo3eYEUteWUtOUtva0NVUVk/view?usp=sharing. In 1975, the U.S. Office of Education went to the extraordinary lengths of awarding a research contract to identify a “taxonomy of practices for which there could be general agreement that ‘this is clearly abusive.’” Researchers at the American Institutes of Research (AIR) performed a literature search of abusive practices by postsecondary institutions and reviewed all 630 complaints USOE had received from students from 1969 to July 1975 about their postsecondary education. In the contract award, USOE had not limited AIR’s research just to abuses committed by proprietary schools. But AIR researchers discovered that all of the 630 complaints that USOE had received in the previous six years involved proprietary schools. Based on its analysis, AIR compiled a list of 14 practices of institutional abuse similar to those identified by the Teague Commission more than twenty years earlier—inequitable refund policies, misleading recruiting and admission practices, untrue or misleading advertising, lack of adequate job placement services, lack of adequate financial stability, etc. See Steven M. Jung, Jack A. Hamilton, et. 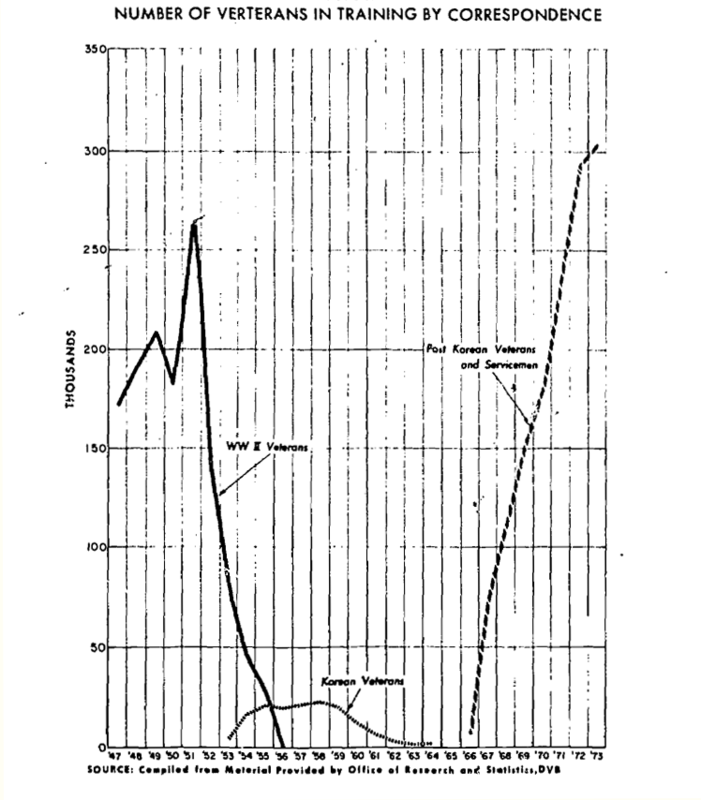 al, “Study Design and Analysis Plan: Improving the Consumer Protection Function in Postsecondary Education,“ October 21, 1975, American Institutes for Research, AIR-52800-10/75-TR, 10, https://drive.google.com/file/d/0B7aqIo3eYEUtNW5CdVhaTElQQVk/view?usp=sharing. Mike Tharp, “Charges of Fraud Hit Student-Loan Program Backed by Government,“ Wall Street Journal, June 30, 1975, 1, 9, https://drive.google.com/file/d/0B7aqIo3eYEUtZWVqWUF3VHJoZGs/view?usp=sharing. Caspar W. Weinberger, “Reflections on the Seventies,“ Journal of College and University Law 8, no. 4 (1981–82): 452-453, https://drive.google.com/file/d/0B7aqIo3eYEUtV0phX2c5bFBYTmM/view?usp=sharing. The proposed rule, initially released on August 15, 1974 (Federal Register 39, no. 159 [August 15, 1974]: 29385), was reissued in May 1975 due to changes Congress had made with respect to an unrelated issue. “Proprietary Vocational and Home Study Schools,“ Federal Register 43, no. 250 (December 28, 1978): 60819, https://drive.google.com/file/d/0B7aqIo3eYEUtQUhtUXRmOTFzZFk/view?usp=sharing. Public Law 93-508, December 3, 1974. With the support of the Nixon administration, Congress also added a requirement in 1972 that veterans and active-duty servicemen had to pay 10 percent of the tab for correspondence courses out of their own pocket. The 10 percent requirement was designed to give GIs a financial stake in their choice of correspondence courses and to encourage them to think through their job training objectives. See the November 27, 1971 letter from Veterans’ Administration administrator Donald Johnson to Vice President Spiro Agnew, reprinted in Educational Benefits Available for Returning Vietnam Era Veterans, Part I, Subcommittee on Readjustment, Education, and Employment of the Senate Committee on Veterans’ Affairs, 92nd. Cong., 2nd Sess., March 23, 1972, 191, https://drive.google.com/file/d/0B7aqIo3eYEUtbHo3N0tya29uRjA/view?usp=sharing. “It’s Time to Protect Education Consumers Too,” remarks of U.S. Commissioner of Education Terrel H. Bell to the Statewide Higher Education Executive Officers, April 24, 1975, 5. Bell noted that “when there is rapid growth in any sector, there is a danger of malpractice. And, as much as we would like to attribute beneficence to the world of education, it, too, has its charlatans—the seekers of the fast buck.” http://files.eric.ed.gov/fulltext/ED108554.pdf. Chester Finn Jr., “In Washington We Trust, Federalism and the Universities: The Balance Shifts,“ Change 7, no. 10 (Winter 1975/1976): 25–26, https://drive.google.com/file/d/0B7aqIo3eYEUtYlM1bW1PTXVVYWc/view?usp=sharing. The VA administrator, Donald Johnson, is quoted in Senate Rep. No. 1243, 94th Cong., 2nd Sess. 1976, https://drive.google.com/file/d/0B7aqIo3eYEUtVS1XUnVCdHVCWlU/view?usp=sharing, 89. Ibid. The industry sued to stop the 85–15 rule, arguing among other things that it denied veterans equal protection of the law since the 85–15 rule didn’t apply to non-veterans, whose education could otherwise be subsidized by the federal government. In 1978, the U.S. Supreme Court rejected that argument and upheld the requirement. It found that the history of the G.I. Bill “revealed a need for legislation that would minimize the risk that veterans’ benefits would be wasted on educational programs of little value. It was not irrational for Congress to conclude that restricting benefits to established courses that have attracted a substantial number of students whose education are not being subsidized would be useful in accomplishing this objective and ‘prevent charlatans from grabbing the veterans’ education money.’”Cleland v. National College of Business, 435 U.S. 213, 1978, https://supreme.justia.com/cases/federal/us/435/213/case.html. Caspar W. Weinberger, “Reflection on the Seventies,“ Journal of College and University Law 8, no. 4 (1981–82), 456, https://drive.google.com/file/d/0B7aqIo3eYEUtV0phX2c5bFBYTmM/view?usp=sharing.